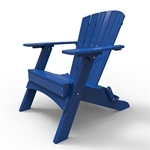 Our well designed and constructed Hyannis Adirondack Chair has a rounded back, the traditional slanted seat and wide armrests for keeping drinks or books at hand. Comes in many colors. 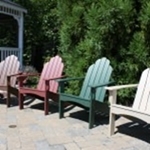 Our well designed and constructed Hyannis Adirondack Chair folds up and out of the way to save you space and make storage easy. Comes in many colors. Our Yarmouth Adirondack Chair has a rounded picket back, the traditional slanted seat and wide armrests for keeping drinks or books at hand. Comes in many colors. 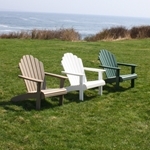 With a little deeper traditional slanted seat than our other Adirondack Chairs have and no visible fasteners, the Hampton is our deluxe model. Comfortable, sturdy and beautiful in every color! We have the perfect chair for your smallest resident or guest! 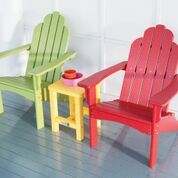 This Adirondack Chair will make any child happy.